It's time for a dance party! 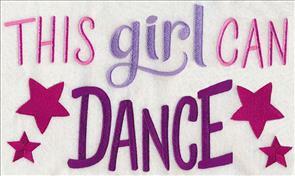 Get ready to move to the music with this week's new dance-themed designs. 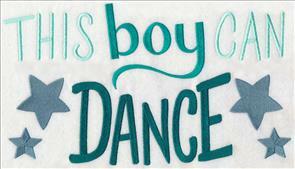 Ballet, disco, tap, jazz, swing, hip-hop, and more! 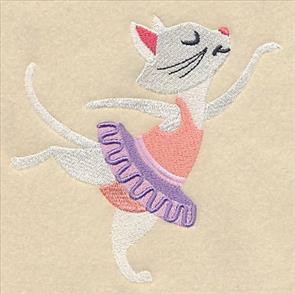 These all-new dance designs are the perfect way to celebrate the fun of whirling and twirling to your favorite song. 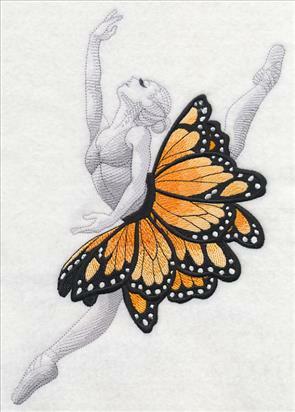 Beautiful ballerinas with tutus made of flowers and butterflies are terrific additions to tote bags and pillows, new shoe designs are great when embroidered on shoe bags, and dance fashion plates celebrate the beauty of your favorite costume. 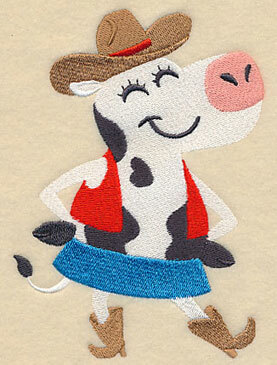 Plus, adorable dancing animals and more! 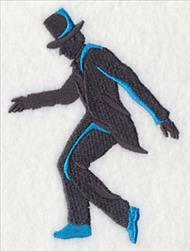 Scroll down to see these groovin' designs and add to your basket now! 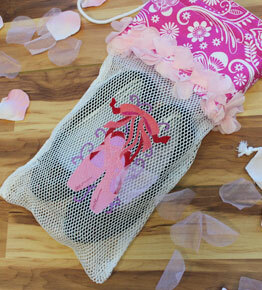 Carry your dance shoes in style with an embroidered shoe bag. 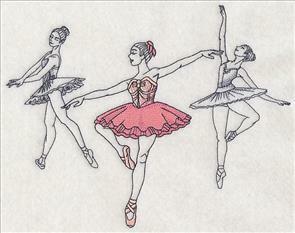 Light, sketch-style ballerinas provide the perfect backdrop for these striking tutus to shine. Pick between the two gorgeous variations: a muted floral skirt or a Monarch butterfly option. 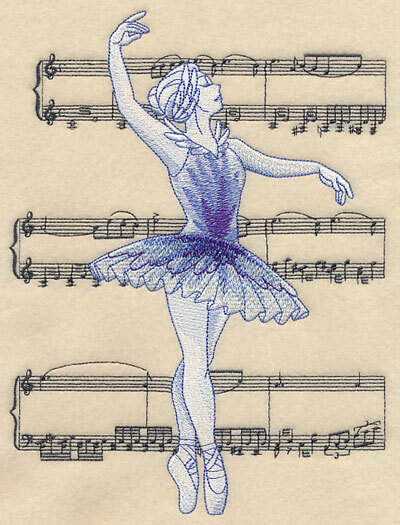 6.90" x 11.70" and 5.54" x 9.40"
6.90" x 9.62" and 5.60" x 7.80" and 4.85" x 6.75"
A stunning ballerina dances in front of the sheet music for Swan Lake in this design. 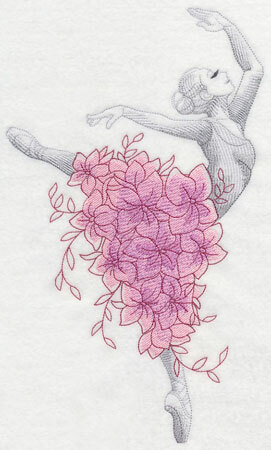 Her traditional costume and graceful moves perfectly match the beauty of the ballet. Stitch on pillows, tote bags, and more. 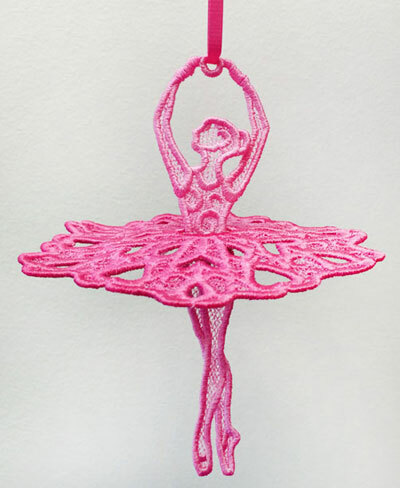 6.89" x 9.15" and 5.87" x 7.79" and 4.86" x 6.45"
Hang this twirling ballerina from windows, light fixtures, or even on your Christmas tree! 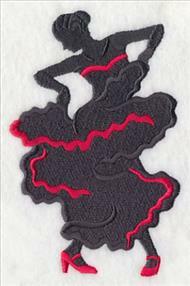 The freestanding lace design is a unique and creative way to celebrate your favorite hobby or sport. 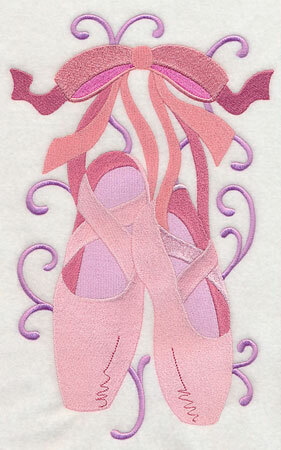 To learn how to make this freestanding lace 3D ballerina, click here. 4.68" x 6.00" and 3.04" x 3.88"
The Dancing Dachshund designs are always a fan-favorite, so we've decided to add animals of all kinds getting their groove on, too! Here, a graceful kitty and disco-ing pug strike a move. 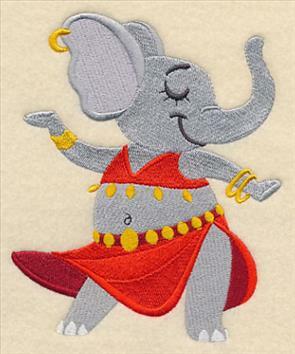 4.28" x 4.86" and 3.40" x 3.87"
A tap dancing owl looks dapper in his bowtie and top hat; an elephant shows her love of belly dancing. 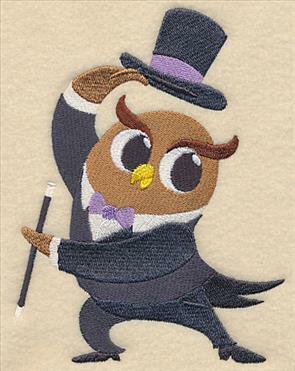 These adorable animals are ready to dance onto your next embroidery project! 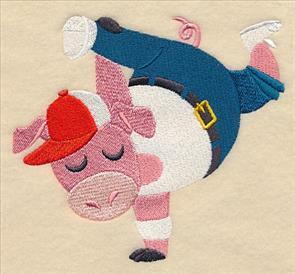 4.83" x 5.85" and 3.18" x 3.86"
Finish the series with a square dancing cow and a break dancing pig. 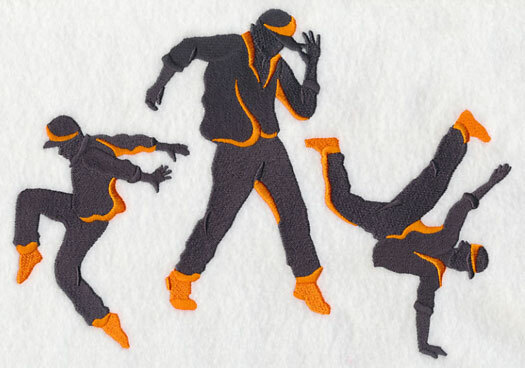 Add all the designs to a too-cute mini quilt, kids' t-shirt, or dance gear! 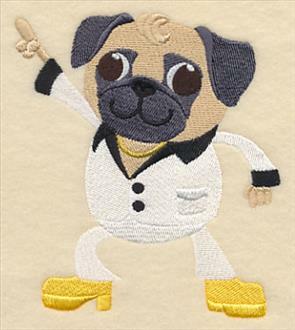 5.41" x 4.85" and 3.85" x 3.45"
Get your dancing shoes ready -- these adorable animals are ready to boogie! 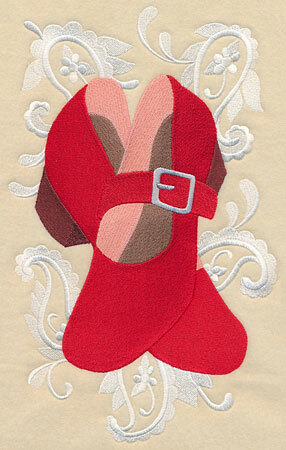 Update the back of a jacket, an embroidered shoe bag, or a pillow with these whimsical dance shoe designs. 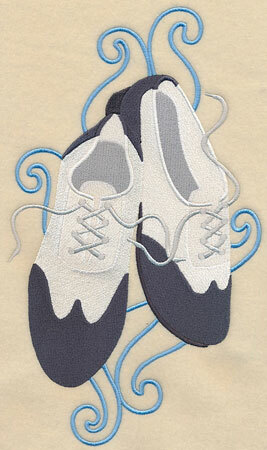 A pair of ballet slippers or tap shoes are a terrific addition to any project. 6.90" x 11.07" and 5.85" x 9.40"
4.86" x 7.80" and 4.27" x 6.86"
6.77" x 11.75" and 5.42" x 9.40"
4.50" x 7.80" and 3.96" x 6.87"
If Irish dancing or square dancing are more your style, use one of these dancing designs on your next embroidery project. Great for blankets, tote bags, and more. 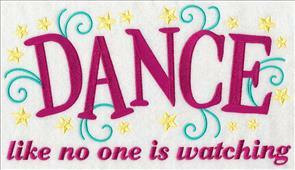 6.90" x 10.66" and 5.88" x 9.09"
5.05" x 7.80" and 4.45" x 6.87"
6.90" x 11.09" and 5.85" x 9.41"
Fun and uplifting dance-inspired quotes are terrific additions to a wide variety of projects! 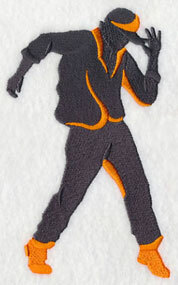 Add to tote and duffel bags, sweatshirts, jacket backs, and more. 11.75" x 6.63" and 9.41" x 5.31"
7.81" x 4.41" and 6.85" x 3.87"
10.69" x 6.85" and 9.07" x 5.86"
7.81" x 5.05" and 6.86" x 4.44"
Tell everyone how much you love to dance with a "Just Dance" or "Eat, Sleep, Dance, Repeat" design. 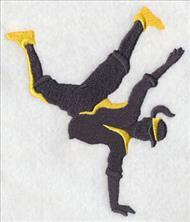 They're full of bright colors and are a fun way to show off your hobby or sport. 11.75" x 4.14" and 9.42" x 3.33"
7.82" x 2.76" and 6.86" x 2.43"
11.75" x 5.59" and 9.41" x 4.48"
7.81" x 3.72" and 6.86" x 3.27"
These fun dance quotes are also terrific additions to framed pieces, t-shirts, blankets, and more! 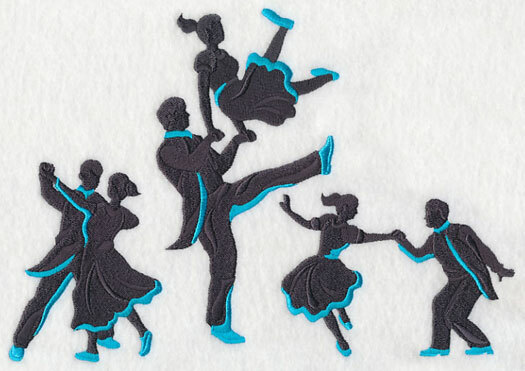 Stitch them to show how well your girl or boy can dance. 11.75" x 6.79" and 9.40" x 5.43"
7.80" x 4.51" and 6.86" x 3.96"
11.75" x 6.61" and 9.40" x 5.29"
7.80" x 4.39" and 6.86" x 3.86"
Dance costumes are well known for being intricately decorating and impeccably designed. 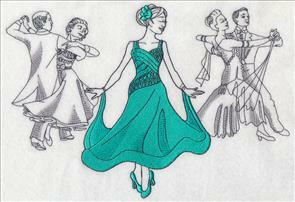 Celebrate the beauty of a ballerina's tutu or a ball gown with these fashion plate designs. 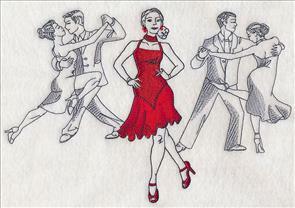 10.10" x 6.89" and 8.58" x 5.85"
7.80" x 5.32" and 6.86" x 4.68"
A Latin dancer's dress is stitched in a fiery red; a swing dancer shows off her purple frock. Stitch these fashion plate designs on pillows, tote bags, and framed pieces. 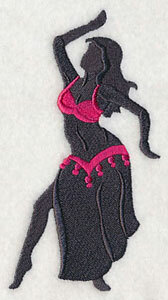 10.09" x 6.90" and 8.58" x 5.87"
9.62" x 6.89" and 7.79" x 5.58" and 6.86" x 4.91"
Both belly dancers and flamenco dancers have especially vibrant costumes. 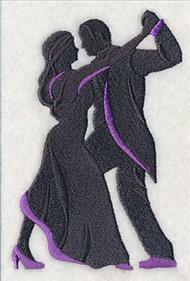 Use these designs on your next dance-theme embroidery project! 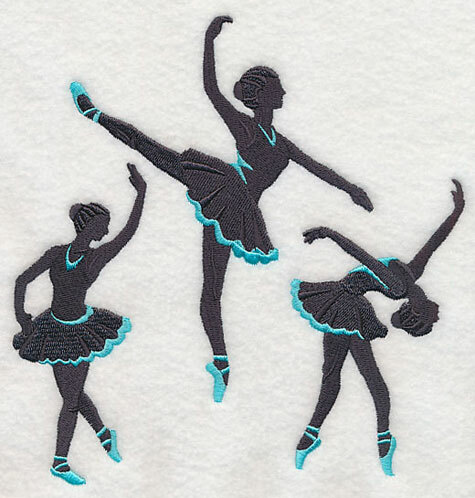 8.47" x 6.90" and 7.80" x 6.36"
7.18" x 5.85" and 5.95" x 4.85"
A trio of ballerina silhouettes is a terrific addition to t-shirts, sweatshirts, jackets, and more! 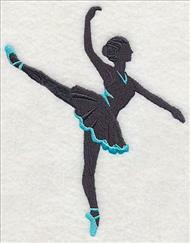 Each of the lovely ballet dancers feature highlights in a bright teal color for extra pizzazz. 6.90" x 7.27" and 5.86" x 6.17" and 4.84" x 5.10"
These ballerinas have been separated out of the trio above, and are available for individual purchase. 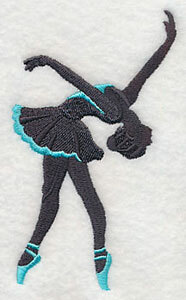 Stitch them as a complement to the ballet trio. 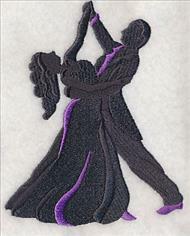 2.66" x 4.57" and 1.87" x 3.21"
Couples perfecting their waltz are accented in pops of purple in this ballroom design. 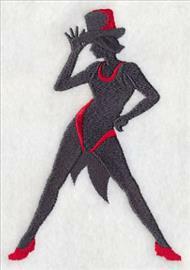 The silhouetted style calls attention to the graceful dance moves instead of the dancers themselves. 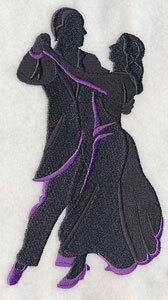 11.43" x 6.86" and 9.41" x 5.65" and 7.81" x 4.69" and 6.84" x 4.11"
Each of the ballroom couples have been created singly, and are available for individual purchase, too. Use them together with the medley design for a matching set. 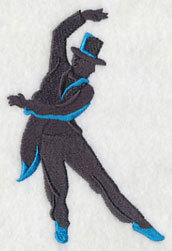 3.90" x 4.93" and 2.33" x 2.95"
Three tap dancers are dashing in their suit coats, bowties, and top hats. 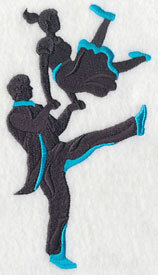 The bright blue accents show the fancy footwork of these dancers. 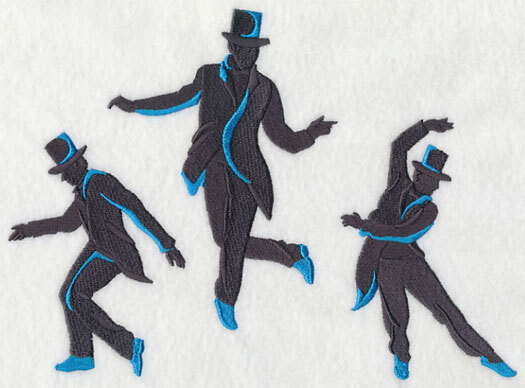 9.55" x 6.90" and 7.81" x 5.64" and 6.73" x 4.86"
Single designs featuring the tap dancers have been separated from the trio above and are all available for individual purchase. 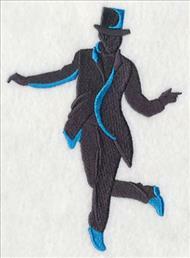 Use them to complement the tap dancing trio, or as stand-alone designs. 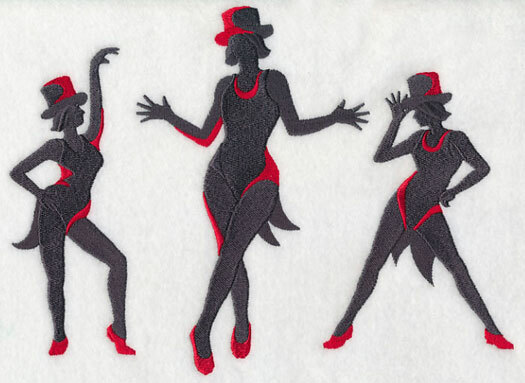 3.29" x 4.93" and 2.32" x 3.47"
Get your jazz hands ready to go -- these ragtime dancers are fabulous additions to a wide variety of projects. Stitch on pillows, framed pieces, and more! 9.35" x 6.89" and 7.81" x 5.76" and 6.56" x 4.84"
These jazzy ladies are also available for individual purchase. 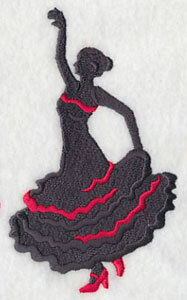 They're a great way to celebrate this traditional style of dancing. 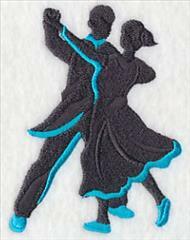 3.51" x 5.22" and 2.46" x 3.67"
These couples are showing off their swinging style in this silhouette trio. 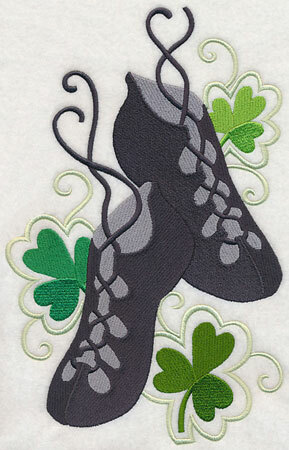 Add the design to tote bags, quilts, and more embroidery projects. 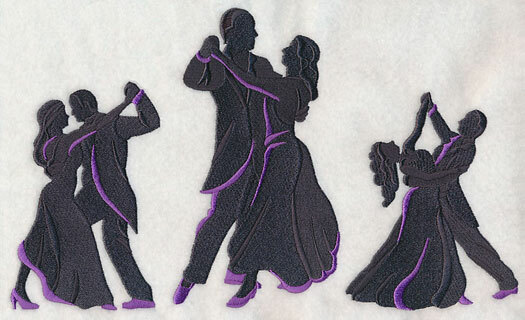 9.82" x 6.90" and 7.80" x 5.48" and 6.86" x 4.82"
Each of the three swing dancing couples have been separated from the trio design above and are ready to be stitched alone! 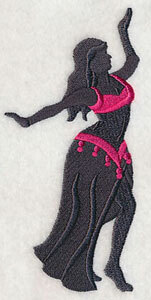 Use in any dance-theme project for a fabulous look. 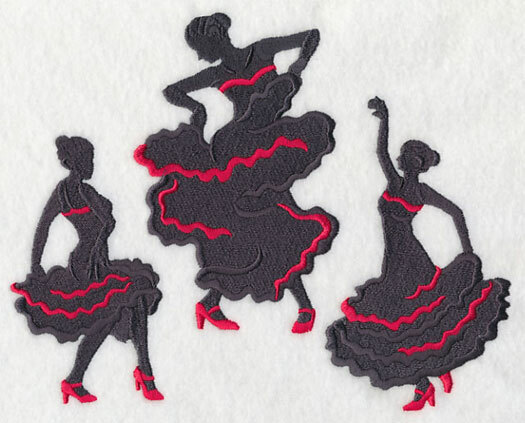 4.57" x 3.21" and 3.19" x 2.24"
Flamenco dancers are known for their intricate costumes and Spanish roots, as well as the finger snapping, handclapping, and rhythmic stomping of the feet that is often found in their dancing. 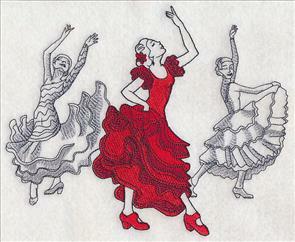 8.59" x 6.90" and 7.30" x 5.86" and 6.05" x 4.86"
Enjoy each of these flamenco dancers alone -- they're all available for individual purchase. 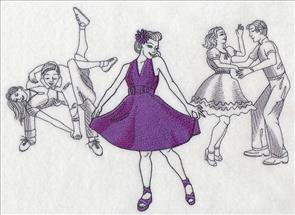 Use in conjunction with the trio design above, or pick your favorite for a separate project. 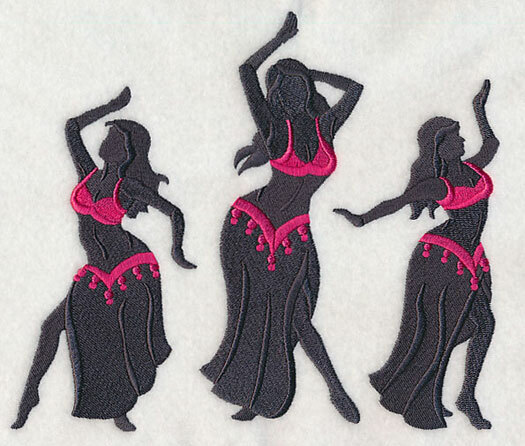 3.24" x 5.40" and 3.30" x 3.80"
Belly dancing is a particular type of dancing from the Middle East that focuses on the connection between the body and the mind. 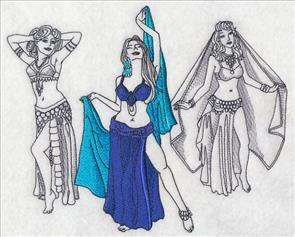 Stitch this trio of belly dancers on tote bags, blankets, pillows, or t-shirts. 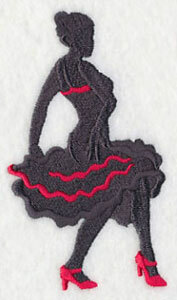 7.80" x 6.67" and 6.85" x 5.86" and 5.69" x 4.86"
Pick your favorite dancer to stitch alone, or use them all! They're a great way to complement the trio design above. 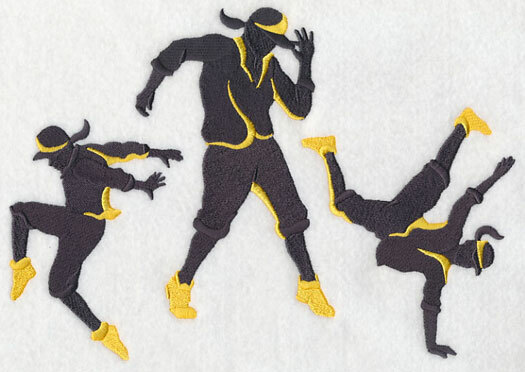 3.48" x 5.55" and 1.86" x 3.90"
Three female hip-hop dancers bust a move in this silhouette-style trio. 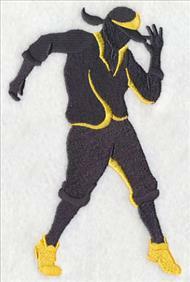 Bright yellow is used to highlight the lines and dance techniques of each of the dancers. 9.77" x 6.90" and 7.81" x 5.51" and 6.84" x 4.83"
These dancers have been separated from the above design and are available for individual purchase. 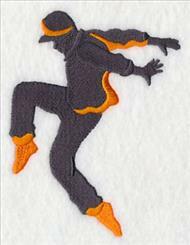 4.10" x 4.85" and 3.79" x 3.39"
A male version of the hip-hop dancers is also available for purchase. 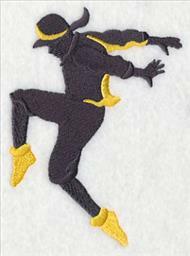 Add to embroidery projects such as duffel bags, sweatshirts, wall hangings, and more. 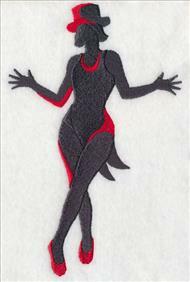 9.87" x 6.90" and 7.81" x 5.46" and 6.90" x 4.83"
Each of the dancers has been stitched singly and is available for individual purchase. They're all available in two different sizes, too! 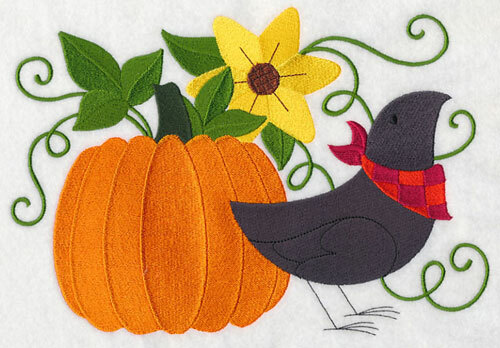 5.41" x 4.95" and 3.78" x 3.46"
Stitch a primitive autumn scene with this pumpkin and crow design. 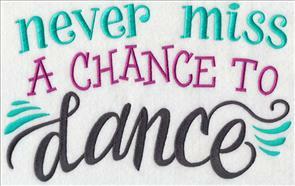 Connie was hoping we'd create this design, as she would love to add it to a pillow. Thanks for the suggestion, Connie! It'd also be a great addition to quilts, aprons, and fall decor. 9.88" x 6.90" and 7.80" x 5.45" and 6.86" x 4.80" and 3.86" x 2.70"